Plant-generated amino acids such as arginine and lauric acid, and moisture-protecting glycosyltrehalose replenish your skin's natural moisture. Ultra thick emulsion produces a gentle lather that rinses clean, resulting in softer, smoother and healthier-looking skin. The washing ingredients of this product are made with the finest ingredients from nature, well-suited for children's delicate skin as well as your own. Convenient pump bottles for single-handed use, perfectly priced for everyday usage. Made in Japan, includes English instructions. Contains skin care oil called Olive Squalene to lock in moisture in the skin, Apricot Extract to moisturize and soften skin along with apriocot's light fruity scent of apricot. Made with a 100% botanical soap base and Glycosyl Trehalose Botanical Proteins (BP) for enhanced moisturizing. Glycosyl Trehalose BP is a natural moisturizing agent to protect skin from damages caused by dryness. Hydrolyzed Oat Protein (one of these botanical proteins) makes the quality of lather higher. In addition, the first three ingredients after water are lauric acid, myristic acid and palmitic acid. These plant-generated amino acids commonly from coconut oil, palm kernel oil and palm oil are featured for replenishing your skin's natural moisture. A large bottle and convenient pump delivers luxurious lathering with true moisturizing in every bath or shower! Cleans, soothes and softens skin with a light fruity fragrance you'll love! For super-sudsy emulsion, pump a little bit of body wash onto a Salux exfoliating bath towels available from TrueRenu. Kracie's extensive line of body washes provide the variety you're looking for... featuring Aloe, Peach, Lemon, Green Tea, Grapefruit, Rose Hips and more. Lather with water or use one of our Japanese bath towels, rinse. Ingredients: Water (aqua), lauric acid, myristic acid, palmitic acid, potassium hydroxide, propylene glycol, sodium laureth sulfate, glycol distearate, lauramidopropyl betaine, cocamide methyl mea, peg-4, fragrance (parfum), stearic acid, cocamide mea, sodium cocoamphoacetate, hydroxypropyl methylcellulose, disodium edta, arginine, polyquaternium-7, guar hydroxypropyltrimonium chloride, peg-7m, butylene glycol, tetrasodium etidronate, glycosyl trehalose, hydrogenated starch hydrolysate, sodium citrate, hydrolyzed oat protein, methylparaben, lavandula angustifolia (lavender) extract, aluminum hydroxide, propylparaben, red 33 (ci 17200), blue 1 (ci 42090), phenoxyethanol. 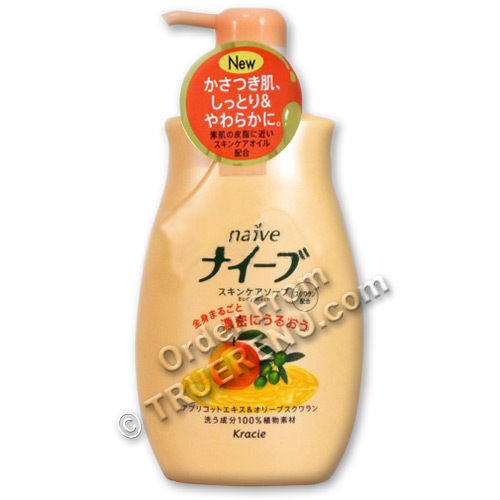 Product Size: Net Volume: 580ml bottle, or about 19.6 US fluid ounces. Page displayed in: 0.2012 seconds.